The Michigan Department of Education has opened an investigation into the certification status of staff at Detroit Community Schools, a charter school in Detroit run by former Detroit city councilwoman Sharon McPhail, Bridge has learned. The Office of Professional Preparation Services launched the investigation as a result of a story Bridge published this week that details problems at the school. The story revealed that, beside struggling academically, the school also has administrators with checkered pasts. Some administrators have received six-figure salaries, two have been central figures in scandals involving misappropriation of public funds and key officials are not certified by the state. Non-certified administrators include McPhail, principal Echelle Jordan and the school’s chief financial officer, William F. Coleman III, the former Detroit Public Schools CEO and superintendent, state data shows. Sharon McPhail, a former Detroit city councilwoman and former general counsel for the city, became superintendent of Detroit Community Schools in 2012. McPhail, who was hired as superintendent in 2012, is a lawyer. Jordan and Coleman have worked at the school since at least 2013, according to payroll documents obtained by Bridge. Michigan law requires all public school administrators who oversee business operations or instruction – such as principals and superintendents – to be certified by the state within three years of taking the position. If administrators do not take the necessary classes and obtain certification, the district or school cannot continue to employ them, under state law. When asked last month why she had not obtained certification, McPhail insisted that she is not the superintendent, but the chief administrative officer, and therefore does not need to be certified. However, the school website, school board minutes as well as audits and emails that McPhail sent to Bridge identify her as the superintendent. But McPhail directed Bridge to a document posted on the school’s website on March 23 – after Bridge’s inquiries – that identifies her as the chief administrative officer. But simply changing McPhail’s title does not mean she avoids the state’s certification requirement, said William DiSessa, a spokesman for MDE. Anyone responsible for the management of a district or charter school needs the certification, he said. William F. Coleman III, the former CEO and superintendent of Detroit Public Schools, is the chief financial officer at Detroit Community Schools. He accepted a plea deal in 2008 to interfering with a grand jury in Texas, connected with a bribery and kickback scheme involving Dallas schools. “Under state law, there are consequences,” to failing to obtain certification, DiSessa said. And those consequences can be stiff; the state can reduce school aid payments to recoup the amount paid to administrators during the time they worked without certification. Also, any school official who knowingly employs a non-certified administrator is guilty of a misdemeanor punishable by a fine of $1,500 for each instance. The Detroit Community Schools is a charter school serving kindergarten through 12th grades. 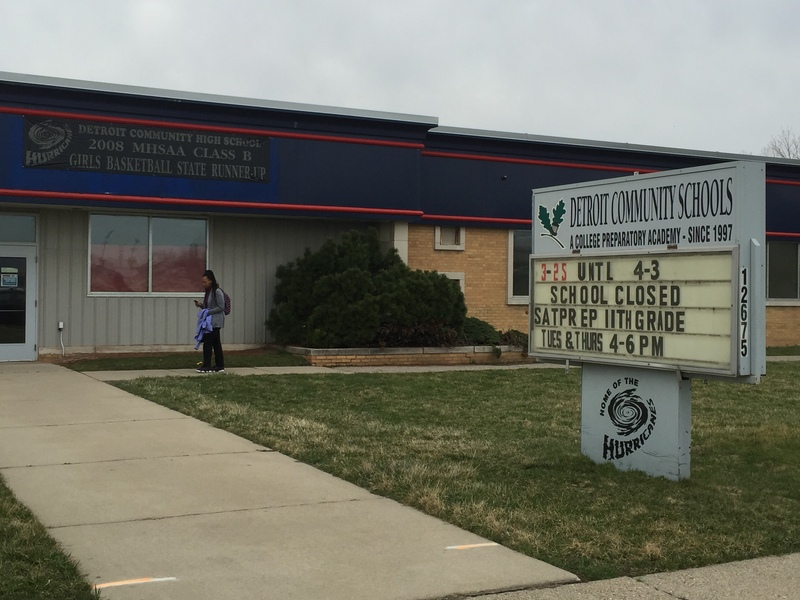 It is the only high school for the 7,000 school-age children in the 7-square-mile Brightmoor neighborhood in Detroit. Opened in 1997, the school has struggled academically. Its elementary grades are ranked among the bottom 6 percent in the state, while the high school has been designated a “reward” school because it improved graduation rates and moved up from the bottom 5 percent of schools in the state to the bottom 25th percentile. Of more than 1,000 students who have taken the ACT college entrance exam at the school over the past decade, only two have passed all four parts of the test and been deemed college-ready. Residents have said the area needs more and better schools. The school sits at the crux of a policy debate over whether the state should approve legislation that would provide $715 million in debt relief for the Detroit public school district, and create a mayor-appointed board that would determine when or if new schools can open in areas of the city that need more and better school options. DiSessa said it is unclear how long the investigation will take. One of many. It's just a question of looking. But the State of Michigan isn't looking. It's 'free enterprise' in action. With our tax money. Until Charter Schools live by the same rules as other public schools we will have issues and problems. Many areas of the state have schools of choice and even to choose elementary schools in their and other districts. You take the taxpayers money you play by the same rules. R.L. Charter schools are governed by the same law and regulation as traditional public schools. The failure here is administrative at the state level. Kudos to Bridge for pointing this out. A caution: How are the children actually doing - we do not know since all we rely on are test scores - despite the reality that these children arrive at school with a huge disadvantage compared to the population that generated the target scores produced by statistical models. We continue to fund education on a per pupil, not per need, basis. Not to mention that the tests being used are a waste of time and effort - they provide meaningless numbers absent any consideration of context. If we continue to treat education as we always have, one size fits all since 1892, how can we expect children to learn when their circumstances, their reality, is totally divorced from the assumptions used to run the system? Charter schools may be governed by the same law and regulation as traditional public schools, but its management companies are not. And that's the rub: public money goes in and then is hidden behind a "privacy" exception. If you don't believe me, just try getting information about charter management company financials. You can't! How do you think convicted felon Steven Ingersoll got a away with it for years, and how it took a whistleblower to finally reveal that his replacement at the Grand Traverse Academy, Mark Noss, is still making monthly five-figure payments to Ingersoll! Where's the investigation into that? Charter Management companies are private organizations that provide a service, primarily instructional support and general business services but specifics depend on the public contract with the school board, just as traditional public schools purchase services from private companies. In both cases financial information on the private firm is not public information. The public budget, required by law, approved in public, as required by law, delineates what services are purchased and how much they cost in compliance with the Michigan School Accounting Manual and generally accepted accounting practices. How will requiring private companies to disclose their financial information improve learning in the classroom? The goal is learning in the classroom, not competing for test scores or to satisfy the curiosity of those who object to innovation and change, things that are long overdue in an industry still operating with rules developed in 1892 and obsessed with imposing meaningless testing regimens, competing for highest score and false accountability in an environment that will not allow teachers to teach - prescribing what will be taught, when it will be taught, how it will be taught, where it will be taught - all prescriptions emanating from those academics and politicians that are not in a classroom and know little about the cognitive process of learning or human cognitive and emotional development - and that absolutely refuse to listen to those that do - the teachers, you know, those people that actually due the work with all the responsibility and none of the authority. How will financial accountability for charter schools improve student performance? First by helping to ensure fiscal integrity and accountability are practiced at the school aiding in overall efficiency, effectiveness and transparency. A plan is always better than no plan at all. A proper plan put into operation and monitored regularly promotes better management and organization. It gives the school a definite direction and an attitude for precision and excellence in all regards. Further if there is an attitude promoting integrity and accountability in school finances this will give the students needed instruction in how rules work and why following rules is a good idea. Finally making sure money is properly spent means there may be more money to spend on programs like sports and after school activities rather than administrative salaries. I really have a problem with any private entity that uses our tax dollars and is not under close scrutiny whether they be schools or prisons. Any entity that feeds off the taxpayer is a "taker" including our illustrious legislators. "Free enterprise" at its worst. Charter Schools receive a per pupil allowance which is expended under public scrutiny by the public, the State Board of education, the Charter School authorizer, an independent Auditor, school administration and board of directors. In addition these financials are posted on the schools' web site and the decisions on how the funds are allocated are made in public. I do not know if private prisons are required to do the same. I doubt it and agree that these are a mistake along with the laws that populate them. Chuck, did you read the original investigative piece on DCS? In a nutshell, it reveals all of the problems with the current charter system including school boards that are neither accountable nor representative of their community. Along with administrators, DCS packed its board with cronies. How are parents -- especially economically disadvantaged parents -- supposed to have their voices heard when the school runs under a veil of secrecy? Just take a look at the public folks on the take in Detroit. All the taxpayer money poured into the bottomless pit of Detoilet with what to show for it? Free enterprise works every time you get the corrupt government bureaucracy BS out of the way. If this is a "for profit" charter school, taking State funds, it must be shut down! The investigation has noticed "issues" all around. All should remember that the FIRST goal of a for profit organization is to Make a PROFIT! All other goals like student education is second! The big salaries of questionable administrators notes it all. This operation appears to be stealing state education funds for their own use. Shut them down and prosecute the offenders and get restitution. Now if this group really does want to run a for profit school ......they can but WITHOUT the use of state funds. The parents. paying the bills, will then be the real judge of the schools performance. Mr. Weaver betrays a complete misunderstanding of how for profit organizations work. He says, "All should remember that the FIRST goal of a for profit organization is to Make a PROFIT! All other goals like student education is second!" He fails to understand that profit is a residual; it is what is left after all inputs have been paid for and a product or service of acceptable quality is provided to the consumer. It is a voluntary exchange between two parties that occurs because each party (particularly the parent) feels they have gotten good value for the money the have spent (in this case money the state has spent on their behalf). Unless Mr. Weaver wishes to assert (and provide evidence) that the parents involved are not competent to judge the quality of their child's education, what right does he, or anyone else, have to interfere in their decision? He says that if state money were not involved, that " The parents. paying the bills, will then be the real judge of the schools performance." But the parents are, in either case, the real judges of the school's performance. How would it be otherwise? If they are qualified to make that judgment in the one case, they are qualified to make it in the other case. Does he, in fact, wish to assert that those parents are not capable of making that judgment, and are, on that account wasting taxpayer dollars? Observer--Nice "Ann Rand reply! Too bad neither she nor you understand how things work in the real world. Being an "Observer ", you should have observed where it said this high school is the ONLY one in Brightmoor. Free enterprise only works if the customer has a choice, preferably several choices. Here's another thing that doesn't work in the real world--for profit infrastructure, with no competition. That includes schools. The facts are in--charters do no better, and frequently do worse (about 30-35% of the time) than public schools. Understand first that the measurement systems used to evaluate schools and teachers are meaningless. Second, applying a defective measurement system designed to reinforce he design and structure of organizations that have not substantive changed in over 100 years to organizations created with innovation and children learning, instead of conforming and complying, is beyond wrong - it is willful ignorance. No one other that the teacher, student and parent know if learning is occurring since the process is subjective, not quantitative. All the psychometrictions in the universe violate the statistical rule that data absent context is meaningless. Charter schools are non profit organizations required to make financial decisions in public just as traditional schools are. Finally, what is going on in Brightmoor has nothing to so with Charter Schools and everything to do with the ineptness of those that control the process and the money, in this case the State of Michigan, which, by the way, is us. Yes, it is the only high school in Brightmoor, but that is one more than was there otherwise, so it is providing a choice that wasn't available before. It has competition from the high schools the parents would have had to use in its absence. Schools do have competition, and Detroit Public Schools have lost out to their competitors, why else would tens of thousands of parents have removed their children from Detroit schools otherwise? The CREDO Institute at Stanford University has determined that there are many charter schools in Detroit that provide an education that is superior to the average Detroit public school. They provide a couple of months extra learning for each year a student attends. Removing local school choices from poor and minority parents and then telling them that they can go to any school -- provided they transport their child however many miles it requires -- is a false choice. Many parents in Brightmoor move their kids into a different school every year because the charter system has created a shell game that hides failure. The CREDO study has been discredited and a more recent study out of MSU shows that school choice has zero impact on student outcomes. None. Nada. Meanwhile, criminals like Sharon McPhail and William Coleman are able to get rich because of a broken system that discourages any evaluation whatsoever. Charters, vouchers, open schools -- call it whatever you want -- have hurt poor and minority students and must be halted until the mess can be sorted out. RIGHT ON!! Sadly Your point will be lost on most of the socialist, government lovin sheeple that populate this website. Are kids going to this school? Are they and their parents happy with the results? If they are what business is it of the state's? If they are not will it not shut down on it's own? What if money is being misappropriated or stolen? What if there is vendor fraud? What if the results are being doctored to look good? What if test scores don't meet required standards? Any or all of these mean it doesn't matter if the kids are happy. And if they're not learning what they should how can they really be happy? Just because they are are charter school doesn't mean they are some kind of wonderful, perfect magic bullet solution. Mr. Plumpe asks a series of questions about possible misbehavior on the part of the school and then asserts that "Any or all of these mean it doesn’t matter if the kids are happy." First, it is not crucial that kids be happy. It is a helpful bonus if they are, but kids are often unhappy and still learn and acquire the skills they need to be successful, healthy adults. What is important is that their parents be happy with how they're doing. An important part of that is that they are "learning what they should'. If they are doing that, of what importance are the answers to Mr. Plumpe's questions? Isn't it preferable that the kids be thriving in a badly managed school than doing badly in a meticulously honest, efficiently run school? Matt is absolutely right. It is results that count. And parents are the appropriate judges of those results. And they have several resources to help them make their judgments. The Michigan Department of Education rates every school (although not in the easiest to use, transparent format). Excellent Schools Detroit is a good source for Detroit parents. The Mackinac Center publishes ratings for all schools that are adjusted for the percentage of socioeconomically disadvantaged students, as does the Center for Michigan. The state is absolutely justified in removing and holding Ms. McPhail to account for plainly violating the law. William, aside from Observers comments as I said If the kids and their parents are happy witht the results of this or any other school, with all that this may mean, what business is it of ours to interject our judgement. We don'y know the school, the kids, the parent or really anything about it. Now I would think that periodic and regular testing to let parents measre results are in order for all students, it seems the Ed lobby and teachers go nuts over the thought of this. It is the state's business (the taxpayers' business, more accurately, the citizens' business) because this school is using our tax dollars and our state's brand. Don't want public scrutiny, don't be a "public" school. The only scrutiny the school needs concerns safety and educational results. If the state spends tax money to buy material in a lumber yard, should it audit their books? Why? What the taxpayer is concerned about is whether or not the lumber is of acceptable quality and that the price is competitive. Similarly, the state is only concerned with the well-being of the students and the quality of the education they are receiving. So you are essentially saying there are no rules to be followed as long as the "results" are acceptable. What a bunch of self serving male cow manure. Of course these "results" are very subjective and easily manipulated. Sounds to me like a classic recipe for malfeasance and fraud. There are rules you know and those rules need to be followed regardless of how "wonderful" the "results" may seem to be. And if you put it upon yourself to charter a school, pay yourself a huge salary and have a questionable past you should not be at all surprised if you are put under extra scrutiny. In fact you should be put under extra scrutiny. It's the only high school in Brightmoor. Nice rhetoric, but it doesn't actually work in the real world. Physically, it is the only high school in Brightmoor. The closest public high school is Cody High and it's a few miles north of the actual Brightmoor neighborhood. Public transportation is inconsistent and there is extreme poverty in this area. Many parents don't have the ability to drive their kids to a different school than the one in the immediate neighborhood. The school may be doing some good things, but the administration are taking huge salaries for not very huge results. ONLY 2 KIDS WERE DEEMED COLLEGE READY?????? Not all children go to college, but this statistic is abhorrent. That's not educating kids, it's passing them along and pocketing the money that comes with "showing improved results." Congratulations to Bridge for bringing this issue forward. But as another commentator noted, it is unacceptable that the DOE needed an article to prompt action. This makes me sick to my stomach. I am a K-12 special education teacher, certified in several things and highly qualified in more. I will never, ever make six figures. How in the hell did this happen? What do the kids think? What happens to them after they graduate, completely unprepared? (You don't have to tell me, I know. I taught in Detroit Public Schools until they closed my school). The kids in Detroit are the most amazing, resilient kids I have taught. A pox on all these folks who are doing such an injustice to them and lining their pockets while they do it. What a shame that Sharon M. a smart gal in her own right, bothers to hook up with a recipient of a 'plea deal' for interfering with a Grand Jury regarding the Dallas schools. Detroit can do better and deserves to. Sharon look in the mirror, you can and should do better for your community. P.S. 2 students qualify for the ACT out of 1,000...tragedy. All sorts of red flags here for a determined and tenacious auditor. Having a number of executives who profit from their generous salaries who have a checkered past as financial administrators or had ties to financially unsavory municipal administrations is more than enough to warrant a full and rigorous audit of the financial books and records. And the school's less than stellar academic performance seems to indicate that the executive management is not doing very well in that particular regard either. Maybe new management is necessary. I hope the State does full scale financial and performance audits very soon and takes appropriate action according to the results of those audits. And those audits should be as full, complete and independent as possible. Based upon the article in Bridge magazine about the Detroit Community School individual comments concerning student and parent satisfaction with the school are irrelevant. The critical point is the reality the school is being managed by non-certified administrators which does not meet State Eduacation Guidelines. All of the individuals in the article have questionable backgrounds and have absolutely no business leading a school. They represent what is so wrong in public education. This situation ranks with the thirteen administrators recently charged with taking bribes and kick-backs. The Detroit Public Schools are in desperate straits and people in charge are demonstrating a total lack of ethics and moral character. The MDE failure to identify these problems prior to the Bridge article is inexcusable. The investigation should take no more than three months and changes must be implemented prior to the start of the 2016-17 school year. Thank you to Bridge Magazine for the solid investigative reporting. This has been going on with Bay City Academy, North Central Academy and Grand Traverse Academy for years and the Michigan Department of Education is doing nothing about it. The chartering university Lake Superior State is letting the school's get away with it and is also part of the misappropriation, money fraud, huge salaries, school administrative titles constantly changing to get away with improper certification, exhorbitant rent contracts, building a new school on the school's ground in Traverse City (making millions off the deal) and charging for a curriculum that isn't a curriculum that has never been tested. These are only a few of the attrocities from the likes of the the for-profit businesses that are running these schools. Mr. Ingersoll may be waiting to go to jail, but he is still profiting from these schools, because all his buddies now running the schools are in on the crimes. Look at the salaries Noss running GTA and his son in law Lynch running BCA and NCA are pulling in and the homes and vacation homes they are part of. These men start so many different LLC'S to divert money from the state and the taxpayer it isn't funny. And what happens to the children and the teachers? They get the short end of the stick. Maybe it is time to get these schools closed so that we as parents and taxpayers can see the money go into the schools where children are learning and happy and where teachers are happy and teaching! The State Department of Ed has little power in relation to charter creation or oversight. The charter authority is centered at Central Michigan University John Engler Institute. This conveniently keeps power away from the state superintendent and the elected state board. Charters have a life of their own largely, free agents under s free agency, circumventing public authority. Glenn, as usual, you are pretty much clueless. CMU is only one of about 14 authorizers in the state. Charter authority is not "centered" there. In this case, the charter school is authorized by Bay Mills, which appears to have done a crappy job of making sure its principals were credentialed. Central Michigan has nothing whatsoever to do with this. Where do you get your information? Seriously? John, I believe Mr. Ikens was pointing out the clout resting within the Engler Institute at Central Michigan University. Corporations bring considerable financial and political clout to Michigan's charter school lobby, and the Engler Institute is at its center. Plan 9 - If that's what Glenn meant, then that's what he should have said. So you're saying that the Governor John Engler Center for Charter Schools at CMU brings considerable "financial" clout to the game? Please let us know how much they've donated to political candidates or committees, because I'm pretty sure it's zero dollars. By the way, great screen name. MDE has plenty of power they can hold up finances are you kidding me? I'm curious as to whether or not Joan inquires if the produce manager at her local supermarket is taking kickbacks from their suppliers. Probably not. She probably makes a judgment as to the quality and price of the produce compared to their competitors. What else would she want to know? Would she pay more for inferior carrots because she believed the management was more honest than its competitor who offered better carrots for a cheaper price? Doubtful. Would she send her kids to a school with honest management, but an education that was inferior to another school? Joan probably just squeezes the fruit and vegetables, which you cannot do to a charter management company. BUT if I could squeeze the management, I would find a rotten taste in my mouth. Yuck where did that rotten fish come from. Bad management produces a bad work environment, that essentially tickles down to the product; children. There may be great teachers, but without a great management team you have nothing and with the money siphoned off by the management team AND LLC's, you have nothing left for the students and teachers. The teachers end up spending their salary trying to buy books and supplies so they can give the kids what they need. Sounds like a rotten way to educate children. Bravo, Bridge. You uncovered some administrators who weren't credentialed, and now the state is investigating them. Nice reporting, and I'm sure you have a broken arm from patting yourself on the back. It's obvious that you're also looking to divert attention from the DPS principals scandal by saying, "Hey! Look at the charter schools in Detroit! They're crooked, too!" Chastity's appearances on Stephen Henderson's radio show lately have revealed just how anti-charter she is, so I'm sure all the DPS people are happy that she's doing her job - boosting DPS at the expense of charter schools. As she has pointed out on the show, she wants this horrible DEC (Detroit Education Commission) to take over the city, and she's doing what she can to make it happen. On the one hand, the DPS apologists say it is all about kids and learning. On the other hand they say tests are to blame so teachers and administrators cannot be held accountable for test results because all kids are different. DPS is broken! It is rife with corruption, mismanagement, and incompetence, That is just on the administrative side. On the academic side, the kids are not learning. Maybe DPS cannot be fixed. Maybe we should stop shoveling money into that pit. If not DPS and (its apologists say) not charter schools, what do these learning experts suggest? Dear Bridge Readers - Please DON'T Google "quivering underbelly" before turning on Safe Search. The results you get will not be related to schools of any kind. The blog's name is "Glistening, Quivering Underbelly", and you don't need 'Safe Search'. Okay I'll give you the benefit of the doubt so let this Management Company open up the records and see what the workers are being paid what's the teacher turnover and we know how the children are being educated I guess free meals in shoes is better than education? Be the first show it off if there's nothing to hide lead the way for Charter Schools I bet you $100 you cant, I mean won't! I can't even believe documentation because QuickBooks is too quick so there make me a believer! I have no doubt that the teachers and staff at Detroit Community School are working very hard to teach their students! The main reason teachers are in any school is because they care about children and they want to help them learn and achieve. Public schools and charter schools have targets on them. Teachers are accused of not doing their jobs, schools aren't making their yearly growth, education is failing our students. These comments and worse are in the news everyday. What you don't think about is what the children hear: I can't learn, I didn't score well enough, I'm really stupid! These news articles need to focus on the fact that while some schools are struggling, they are making gains. It took a long time for the schools to decline, so why aren't you looking at the gains that are being made and say "Wow, they have made some gains and they are trying to do better." If you think back to when you were in school, 1 bad grade dropped your GPA like a rock, but it took a lot of good grades to pull it back up to a decent grade. There is no "instant" fix to this problem, but give the school credit for making progress! That's exactly right you need better schools better qualified people it's all up to the administration it's very simple they could have stopped this from going this far by simply opening the books it's that simple! If the ministration cared so much they would do that for the kids for the kids! It's my understanding, while Sharon McPhail has been in charge of the school it's no longer listed on the failing school list. Besides the test scores improving, students and parents feel their needs are being met and they are being heard. We need to encourage this trend of achievement. I believe Sharon McPhail has integrity, and she will do whatever it takes to continue empowering Detroit's children.